Romania remains open to both Nabucco and Gazprom’s South Stream projects. ‘Romania is ready to back any project adopted by the EU, both Nabucco and South Stream,’ Vosganian stated during a press conference, Mediafax informs. The Finance Minister’s statement is the first in which a Romanian official reveals that Romania is interested in the South Stream project, a project that the analysts see as Nabucco’s direct competitor. Nabucco is backed by the EU as an alternative to the natural gas imports from Russia. Nabucco’s costs are estimated at EUR 7.9 bln. One third of the project will be financed by shareholders and two thirds by banks. South Stream, a project spearheaded by Russia’s Gazprom and Italy’s ENI, is evaluated at EUR 10 bln and seeks to build a pipeline that would supply Russian natural gas to Europe. Gazprom has already signed agreements with Bulgaria, Serbia, Greece and Hungary, while Slovenia and Austria could take part in the South Stream project too. The Finance Minister’s statements come after it was recently rumored that Romania could take part in the South Stream project. Vosganian added that for the time being there is no official Romanian intention in this direction. ‘Officially there is no such intention. There were certain signals to which Romania reacted with openness. Romania will take part in any formula that would strengthen energy security,’ Vosganian pointed out. Investments in energy efficiency will top EUR 15 bln in the next four years and EUR 30 bln by 2020, Finance Minister Varujan Vosganian stated yesterday. The investments will seek to double the production capacity of Nuclearelectrica’s nuclear power plant and to form partnerships worth EUR 3.4 bln for Termoelectrica’s power plants in Galati, Braila, and Borzesti, according to the Finance Minister. ‘Likewise, between EUR 3 bln and EUR 4 bln will be invested in the thermal power plants located in Oltenia,’ Vosganian pointed out. Monday, November 18, leaders from Greece, Turkey, the United States, Azerbaijan, Georgia, and Italy will officially launch a new Turkey-Greece pipeline project along the Maritza River. The 300-kilometer-long natural gas pipeline will carry Azerbaijani gas to Europe, bypassing Russia. According to Turkish Energy Ministry officials, this will be the first time Caspian gas will reach Europe without going through Russia. U.S. Secretary of Energy Samuel Bodman arrived in Istanbul today, November 15, for a conference with Turkish Energy Minister Hilmi Guler. Bodman is also expected to attend Monday’s ceremony. Azerbaijani gas will flow to Europe through this Southern Caspian corridor thanks to Turkish cooperation. The achievement will send a message to the Caspian states that they do not need to solely depend on Russia either in exporting their hydrocarbon resources to Europe or in meeting their energy needs, said Ankara-based Western energy analysts. Construction of the Turkish-Greek pipeline, dubbed the “South European Gas Ring Project,” was launched in July 2005, and will eventually extend to Italy via a pipeline to be constructed under the Adriatic Sea, according to an intergovernmental agreement signed on July 26, 2007, among Greece, Italy, and Turkey. Construction of that section should start next year and be completed in 2012. The European Union is helping finance the €130 million Turkey-Greek project. Gas from Azerbaijan’s Shah Deniz field started flowing into the new pipeline last month. Eventually the pipeline should handle 700,000 cubic meters of gas per day, or 250 million cubic meters (mcm) per year. “This is currently a symbolic amount of gas that will increase in the coming years. Although the amount is symbolic, it is important in developing relations between the two NATO allies [Greece and Turkey are still at odds over the sovereignty rights in the Aegean Sea] as well as an important step in opening a new [non-Russian] corridor to Europe,” said an Energy Ministry official (NTV, November 12). Azerbaijan plans to ship around 12 billion cubic meters (bcm) of gas per year, first to Greece and then to Italy. Of that, 3.6 bcm will go to Greece and 8 bcm to Italy, said Turkish Energy Minister Guler when he presented his ministry’s budget to parliament on November 6. Turkish energy experts believe that Shah Deniz will be able to provide ample gas to supply the Turkish-Greek and Italian pipelines. But despite Guler’s earlier remark that Turkey would buy 15% of the Shah Deniz gas to be transported to Greece, Turkish energy analysts close to the negotiations recently told Jamestown that Azerbaijan has not agreed on a contract that will allow Turkey to take 15% of the gas. “Azeris fear that Turkey may sell this portion of gas that it seeks to buy to third parties for a higher price, undermining Azerbaijan’s ability to control the gas prices. But in essence, Turkish demand to buy additional gas stems from its real concern about meeting its growing domestic energy needs rather than, at least in the short term, to become a hub to store the extra gas to sell to the third countries,” an Ankara-based Western analyst told Jamestown. Although Turkey has emphasized its desire to become an East-West energy transit route for carrying Caspian gas and oil to Europe, meeting its growing domestic needs remains its priority concern, said the Turkish Energy Ministry sources. In addition, Turkey does not want to rely on a single country for nearly one-third of its energy needs, especially not Russia and Iran. The South European Gas Ring Project marks Turkey’s first concrete step toward its goal of becoming not only an energy bridge to the Caspian oil and gas reserves, but also to preempt expected increases in both domestic and international gas demand. 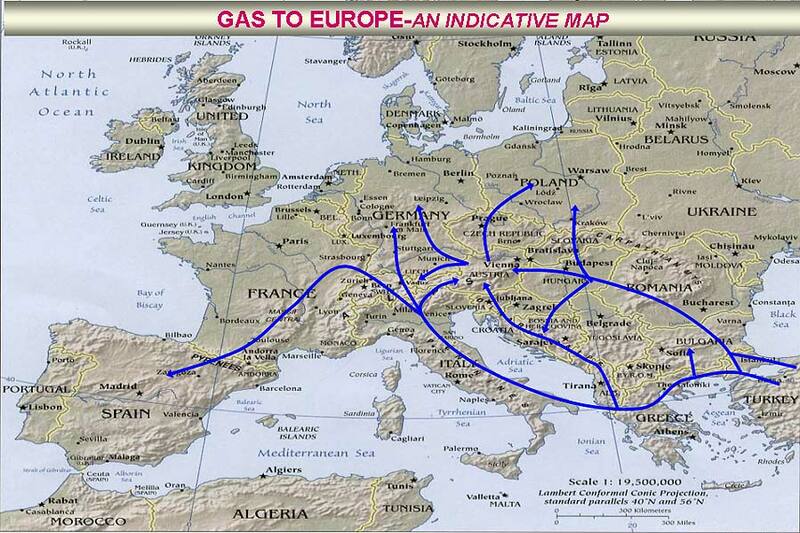 Turkey should carry at least 20 bcm of natural gas to Europe in 2010. In July of this year, Turkey received the first shipment of natural gas via the 1,050-km Erzerum line from the $4 billion Shah-Deniz project under a 15-year deal signed with Azerbaijan in March 2001. Shah-Deniz will supply 1.3-1.4 bcm of gas to Turkey and 0.3-0.4 bcm to Georgia in 2007. The maximum annual exports during the project’s first stage will amount to 6.6 bcm to Turkey and 0.8 bcm to Georgia in 2009-2020. BP has a 25.5% share in the Shah Deniz group alongside Statoil (25.5%), Iran’s OIEC (10%), TotalFinaElf (10%), the Russian-Italian joint venture LukAgip (10%), Turkey’s TPAO (9%), and Azerbaijan’s state oil company SOCAR (10%). Turkey, meanwhile, has benefited from the $4 billion Baku-Tbilisi-Ceyhan (BTC) pipeline to take oil from the Caspian Sea to the Mediterranean, sidestepping major energy producer Russia while also bypassing the Turkish controlled strategic and busy Bosporus and the Dardanelles Straits.